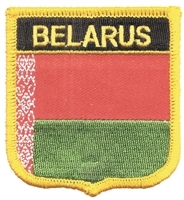 7383 - BELARUS medium flag shield embroidered patch. 2.5" wide x 2.75" tall - Patches sew or iron-on and are carded for a retail display for stores. 6630 - MADAGASCAR medium flag shield souvenir embroidered patch. 2.5" wide x 2.75" tall - Patches sew or iron-on & are carded for a rack display for stores. 6716 - MALAWI medium flag shield souvenir embroidered patch. 2.5" wide x 2.75" tall - Patches sew or iron-on & are carded for a rack display for stores. 6961 - MALAYSIA flag shield souvenir embroidered patch. 2.5" wide x 2.75" tall. Patches sew or iron-on & are carded to hang on a display rack for stores. 7501 - MALTA medium flag shield souvenir or uniform embroidered patch. 2.5" wide x 2.75" tall - Patches sew or iron-on & are carded for a display rack for retail stores. 6495 - US x Mexico friendship flags embroidered patch. 3.125" tall x 3.375" wide. Patches sew or iron-on & are carded for rack display for stores. 6491 - MEXICO medium flag shield embroidered patch. 2.5" wide x 2.75" tall - Patches sew or iron-on and are carded for a retail display for stores. 6494 - Mexico flag uniform or souvenir embroidered patch. 2.25" tall x 3.5" wide - Patches sew or iron-on & are carded for a display rack for stores. 6492 - MEXICO mylar flag shield uniform or souvenir embroidered patch. 2 13/16" wide x 3.25" tall - Patches sew or iron-on backing & are carded for a display rack for stores. 6496 - MEXICO wavy flag ribbon souvenir embroidered patch. 1.75" tall x 4.875" wide. Patches iron-on & are carded for a display rack for stores. 7499 - MICRONESIA medium flag shield embroidered patch. 2.5" wide x 2.75" tall. Patches sew or iron-on backing & are carded to hang on a display rack for stores. 6499 - MONGOLIA medium flag shield embroidered patch. 2.5" wide x 2.75" tall. Patches sew or iron-on & are carded to hang on a display rack for stores. 6501 - MOROCCO medium flag shield - 2.5" wide x 2.75" tall. Patch has an iron-on backing. Patches are carded to hang on a display rack for retail stores. 7393 - MYANMAR medium flag shield embroidered patch. 2.5" wide x 2.75" tall - Patches sew or iron-on & are carded for a display rack for stores. 6778 - NAURU medium flag shield souvenir embroidered patch. 2.5" wide x 2.75" tall - Patches sew or iron-on & are carded for a rack display for stores. 7301 - NEPAL medium flag shield embroidered patch. 2.5" wide x 2.75" tall - Patches sew or iron-on backing & are carded for a display rack for stores. 6513 - NETHERLANDS ANTILLES medium flag shield embroidered patch. 2.5" wide x 2.75" tall. Patches sew or iron-on & are carded to hang on a display rack for stores. 6511 - NETHERLANDS medium flag shield embroidered patch. 2.5" wide x 2.75" tall. Patches sew or iron-on & are carded for a retail store display rack for stores. 0-7198 - NEW CALEDONIA medium flag shield souvenir embroidered patch. 2.5" wide x 2.75" tall - Patches sew or iron-on & are carded for a display rack for stores. 6521 - NEW ZEALAND medium flag shield souvenir embroidered patch. 2.5" wide x 2.75" tall - Patches sew or iron-on & are carded for a display rack for stores. 6531 - NICARAGUA medium flag shield souvenir embroidered patch. 2.5" wide x 2.75" tall - Patches sew or iron-on & are carded for a display rack for stores. 7311 - NIGERIA medium flag shield souvenir embroidered patch. 2.5" wide x 2.75" tall - Patches sew or iron-on & are carded for a display rack for stores. 6541 - NORWAY medium flag shield souvenir embroidered patch. 2.5" wide x 2.75" tall - Patches sew or iron-on & are carded for retail rack display for stores. 6546 - NORWAY wavy flag ribbon souvenir embroidered patch. 1.75" tall x 4.875" wide. Patches sew or iron-on & are carded to hang on a display rack for stores.